Some of our wonderful Polycycnis species are flowering this month. Polycycnis is a genus of Euglossine bee pollinated orchids in the Stanhopeinae native to Central and South America. The flowers are small and delicate with a graceful arching column (reminiscent of Cycnoches, with whom they share a name derived from the Latin root cycnis, meaning swan). All the Polycycnis species have labella that are to some degree hairy. I'm amazed that any insect would regard the extraordinary velcro lip of Polycycnis muscifera (above) an enticing landing platform. Those long hairs must act as a flag to attract the bee's attention to the landing field. 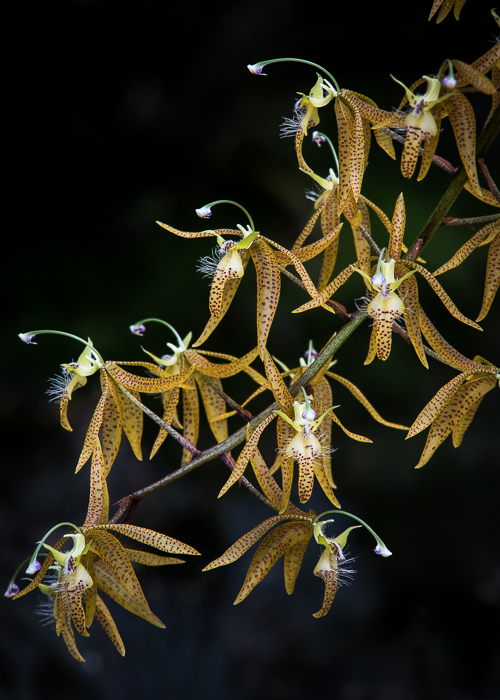 Like other Euglossine bee pollinated orchids, Polycycnis offers fragrance compounds as a reward to male Euglossine bees. The bee lands on the lip and starts scratching near the base in order to obtain the fragrance volatiles. The weight of the bee pulls the flower down. When the bee starts hovering to transfer the fragrance to his hind legs, the flower's sticky viscidium disc, which you can see above in profile projecting like a tab from the club-like column, attaches to the bee's thorax. 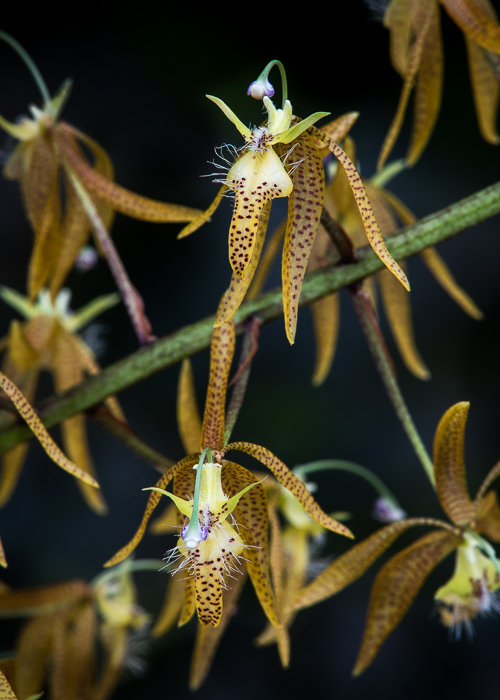 Polycycnis are not at all common in cultivation, so be sure to stop by and catch ours in flower!